On your wildlife tour visit the Kaziranga National Park, located on the banks of the mighty Brahmaputra River. This national park covers an area of approximately 430 Sq. kms with its swamps and tall thickets of elephant grass making it the ideal habitat for the Indian one-horned. Wildlife viewing becomes fairly pleasurable at the vast area of Kaziranga. 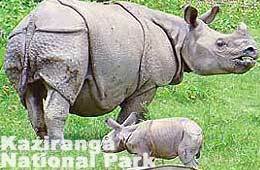 Kaziranga is the only national park reserve in India where the rhinoceros can be seen in its natural habitat. You also get to see the tiger, elephant, the hyena, Indian deer, Sambar, Nilgai, Chinkara and the Chowsingha, along with the crocodile and the long-tailed Langur. 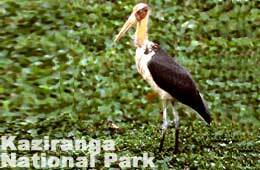 Kaziranga is also home to a wide variety of exotic birds. One can go to Kaziranga from Guwahati by road. Alternatively, one can take a boat ride on the mighty Brahmaputra River. While on wildlife tour to Kaziranga you can take a close look at the huge boulder behind the shrubs, perched safely on top of an elephant. The park is rich in vegetation and beautiful natural surroundings. Here you can find some rare birds. A few lakes inside the park are home to 5,000 birds, the most important being cranes and flamingoes. Both greater and lesser flamingoes rummaged among aquatic vegetation for food. A trumpet call gave away the presence of Sarus cranes at a filed near the lake. You will find the kingfisher; the osprey and the marsh harrier in search of food, while the crane, cormorant, darter and the heron nestle in the thick green foliage. Watch the male Nilgai partially hidden by the tall grass. This iron-grey color creature, takes on a black color as it matures, while the female is brown in color. Further ahead you can see a herd of chital, the Indian spotted deer and a tiger, crouching behind a bush. Here you can find a herd of blackbucks, the blackish brown and white bucks with their long spiraling horns, the young brown and white bucks with shorter horns, and the fawn and white doe with no horns. More than 250 blackbucks and 25 nilgai gather here to fee on illet. What makes the Kaziranga National Park quite different from the other forest reserves in India is its sheer size and the abundant variety of flora and fauna. And it's probably the only forest where you can still look a rhino in the eye. Getting There: Jorhat is the nearest airport, 97 kms. away. Approach is also possible from Guwahati airport (240kms) by road via Nowgong. The nearest convenient railhead is Jorhat. Kaziranga is on National Highway 37 and the roads are in very good shape. Public Transport (by luxury bus) is cheap and comfortable. Accommodation: Wild Grass Resort is strongly recommended for comfort and convenience. They arrange for everything and can provide top class guides. Forest Dept. run Tourist Bungalows are also available and should be booked in advance. The Arayan Lodge and Bonani Lodge will provide comfortable quarters. Climate: The average temperature around Kaziranga National Park in summer is 32.2� C and in winter 10� C. The average rainfall is 160 cm. Tourists are advised to wear cotton in summer and woolens in winter. The best season for visiting Kaziranga is November to April. The off-season is from May to October.